Home to various educational institute and businesses, Navi Mumbai has seen a rapid development in the recent times. Neighbour of Mumbai, it has well-connected areas and boasts modern planning. With the facilities and amenities, it has become a preferred choice for hosting grand wedding events. To simplify your arrangements post the selection of marriage dates, we bring to you a list of some of the best wedding venues in Navi Mumbai. Four Points by Sheraton have their internal wedding specialist team who look after all your wedding related services, right from decorating the venue to match the fanfare of your wedding festivities, serving delicious multi-cuisines to foot-tapping music and entertainment facilities. The mesmerising interiors of Four Points by Sheraton will instantly make you want to book it immediately for your wedding. 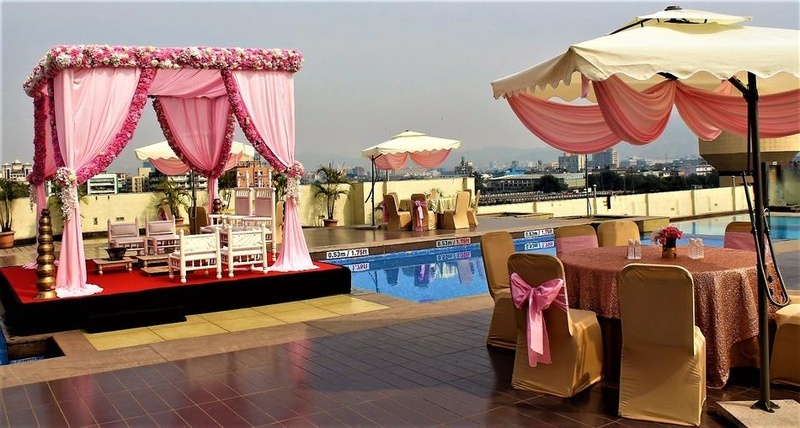 This banquet hall in Vashi has a contemporary architecture and allows a mandap setup right beside the pool. The three different banquet spaces are perfect to host pre-wedding functions, like mehndi and sangeet, while a combination of these party areas offers a wider space for bigger celebrations. Celebration Banquet Vashi, Mumbai is a versatile venue for weddings, receptions, sangeet night and cocktail parties. Whether you are thinking of hosting a birthday party or a full-fledged wedding reception, the venue’s in-house decorators can create magic! Try out their delicious cuisines and be prepared to be impressed by their impromptu services for your next event. Celebration Hall has pillar-less banquet halls for the perfect and unobstructed view of functions. It is located close to Vashi Station and Sanpada Station. At Celebration Banquets by Imperial, Vashi, Mumbai, you can also get the combined hall when you are planning to host a party for a large gathering. Head here for your next party and you are sure to receive the best of services for sure! Tithee Banquets is one of the finest banquet halls in Panvel that welcomes you to host all your special occasions with them. With varying capacities, the banquet hall can serve for small events like birthdays to grand affairs like weddings. The hall can be divided in such a way that one can have different functions at different time slots. Giving you the best-in-class experience, the team here offers customized services to serve each guest. You along with your guests will surely cherish the moments spent here. Services like catering, decoration, complimentary changing rooms are also at place, making this venue a go-to option for all. The interiors of Tithee Banquets, Panavel, Mumbai are self-decorative and make the perfect background for your wedding snaps. K Stars Hotel, Belapur, Mumbai, is the largest hotel in C.B.D. Belapur. It has been designed keeping in mind the comfort of 3-star hospitality and unmatched convenience of a key location. Situated in the Heart of Navi Mumbai, K Star Hotel Belapur is easily accessible because of it's direct connectivity to Palm Beach road and Mumbai-Pune highway. It is located at a close distance from EFC Engineered Foam Company Pvt. Ltd. and C.B.D Belapur Station which makes it easily accessible for all. Hotel K Star Belapur serves mouthwatering multi-cuisine delicacies to choose from in both vegetarian and non-vegetarian food. The venue offers a comfortable stay for the outstation guests. It has multiple party areas which makes it easy to have different functions at the same venue.